Hello everyone! I've released Open Source SHP Builder 3.36. The main features are the mass frames operations. You can now copy, move, delete and even reverse a massive amount of frames at once (with its respective shadows). 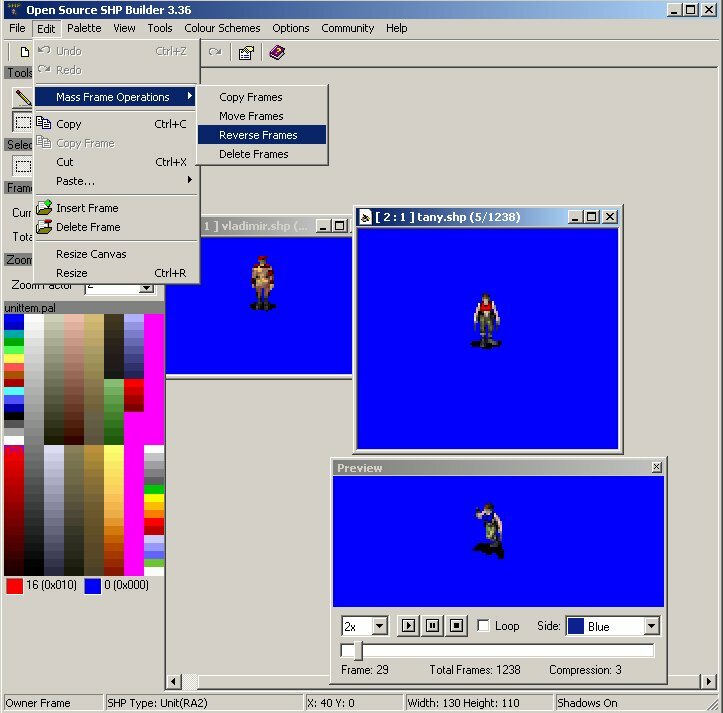 The program also includes new ways to export your SHPs as the most common images files, new flood and fill tools, some new image effects and the possibility to paste the content of the clipboard into a new SHP or a new frame. - Added: Copy Frames: You can now copy a mass of frames to a new SHP or an existing one. You can also make it copy the related shadow frames. - Added: Reverse Frames: You can now reverse a mass of frames. You can also reverse the related shadow frames. - Added: Move Frames: You can now move a mass of frames to a new SHP or an existing one. You can also make it move the related shadow frames. - Added: Delete Frames: It allows you to delete a massive amount of frames and its respective shadows at once. - Added: Flood and Fill with gradient. This new tool works like the normal flood and fill, except that it consider nearby colours. - Added: Flood and Fill with Blur. This new tool floods a region based on its avarage colour. - Added: New image effects are available. All of them are exclusive to OS SHP Builder: Poly Mean (a lighter way to blur the image), Mean Squared (another blur method that only considers neighbors), Logarithm Darkening (a nice tool to darken your colours), Square Depth (similar to X-Depth, except that it considers a square instead of an X), Uber Noise (generates too much random noise in the selected area). - Added: Paste as New SHP. You can also select the type and game of it before pasting, so it affects the palette during conversion. - Added: Paste as New Frame. - Added: New Colour Conversion Method (CCM): 3D RGB Structuralis. This is something between the Full Difference and Infurim, with a quality close to Infurium, but nearly as fast as Full Difference. This is now the default CCM of the program. - Added: Side colour on preview. You can now view your SHP with remaps on the preview window. - Added: You are now able to export specific frames as SHP. - Added: You are now able to export a single frame into a Sprite Sheet. - Added: Support for 'Send To OS SHP Builder' option from OS: Voxel Viewer 1.6. - Added: Support for compression 2 SHP (TS) files. Few files from Yuri's Revenge uses this compression. Note: The program does not save files with this compression, because it's a waste of disk space. - Updated: Pencil is no longer the default tool. The new default tool is the dropper. - Updated: Now, almost everywhere the user can select a CCM, you'll see a small description of the efficience of each. - Updated: 3D RGB Infurium is now faster, since it uses caching again, but restricted to certain situations. - Updated: Code to save SHP (TD) files received a light update. - Updated: The caption colour of the tools in the left side is now a grey colour. Better than the old white one. - Updated: Community links were updated. - Updated: Help file and program icon updated. Thanks IcySon55 for the icon. - Bug Fix: GIF files are now imported correctly and faster. - Bug Fix: Auto Detection of transparent colour on GIF file is now done on every frame. - Bug Fix: The program will no longer try to import empty gif frames. Instead, they'll be simply empty, with the background colour. - Bug Fix: New generated SHP files won't save corrupted SHP (TS) files anymore. If you were victim of this trick, edit the very first byte of your SHP to 00 with a hex editor. - Bug Fix: SHP (TS) files with no height or width will now show a warning and refuse to load them, instead of bug the program. - Bug Fix: The program will now react properly when a user tries to create an new SHP with dimensions that the system memory can't handle. - Bug Fix: Rendering issues that prevented users from viewing or select pixels in the borders on some zoom levels were fixed. - Bug Fix: If you are editing a TD or RA1 SHP, the natural tendency when clicking save is to save a SHP (TD) file. The code regarding this kind detection when saving files and saving file as has been fixed. - Bug Fix: Fixed a minor MDI problem that could happen when the user was creating/opening its first SHP. - Bug Fix: Fixed a MDI bug where several menu options of the program would not be available after the user close the first (of several) window of the opened SHP. - Bug Fix: When you open and close files, the menu stays at the left side. - Bug Fix: The program now detects if a preview is opened or not when users create new SHP files. - Bug Fix: Reduced chances of Importer cause Invalid File Handle problems (I/O Error 6) if the active palette doesn't exist. - Bug Fix: The program will no longer crash or corrupt the list of Colours To Spare, in the Colour Replacement tool, when the user deletes the first colour. - Bug Fix: Autoshadows is no longer available on any situation. - Bug Fix: You can now move from the first frame to the last one, with one spin down move. - Bug Fix: Paste will no longer consider the first colour of the clipboard bitmap to be the colour 0. The result is that blue blocks or weird blocks seen during the pasting will no longer appear. - Bug Fix: Flood Fill, Select, Line and Dropper have proper icons in the left side. - Removed: The following Colour Conversion Methods (CCM) were removed: Auto Selected and all non-3D RGB ones. They are still supported by the program, but the user can no longer select them. They were too bad and only caused headaches. I recommend everyone to update your OS SHP Builder for this version. You can download it at our Utilities Section. Support for this tool is available at PPM Forums. If you have a site, feel free to mirror it without asking for permision. You can also play with its source code and add your own features on the program. Just credit myself and Stucuk for the program. Enjoy it!